L: 159.5" x W: 119" x H: 38.5"
Wilkinson 4-pc. Sectional Sofa Grand but cozy. Stylish but fuss-free. With the Wilkinson 4-piece living room collection, you can have the best of every world! This set’s upholstery looks stunning, but is durable enough to stand up to years of family use. It has such a great look, too, with myriad accent pillows featuring a variety of eye-catching patterns. With the pieces in this group, you have a number of sectional configuration options, and you can pair any of them with the on-trend accent chair and cocktail ottoman, each of which echo the pillows’ prints for a professionally designed look. Grand but cozy. Stylish but fuss-free. With the Wilkinson 4-piece living room collection, you can have the best of every world! This set’s upholstery looks stunning, but is durable enough to stand up to years of family use. It has such a great look, too, with myriad accent pillows featuring a variety of eye-catching patterns. 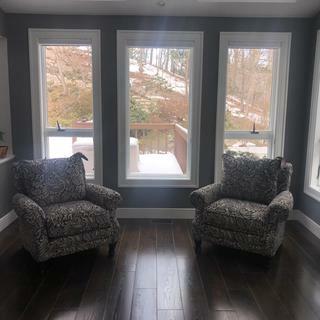 With the pieces in this group, you have a number of sectional configuration options, and you can pair any of them with the on-trend accent chair and cocktail ottoman, each of which echo the pillows’ prints for a professionally designed look. L: 159.5" x W: 119" x H: 38.5" Frame Height w/o Pillows: 38.5"
L: 72" x W: 47" x H: 38.5"
L: 47" x W: 47" x H: 38.5"
L: 68.5" x W: 47" x H: 38.5"
L: 44" x W: 68.5" x H: 38.5"
Includes left arm facing loveseat, armless loveseat and right arm facing chaise. This stain-resistant, easy-care fabric boasts a soft feel, yet it’s tough enough for extensive, everyday use. Mortise-and-tenon frame joinery is reinforced with corner blocks and glue to ensure strength and stability. Perfect family sectional !!! Most comfortable, extra deep, beige sectional, at a reasonable price!! ?? 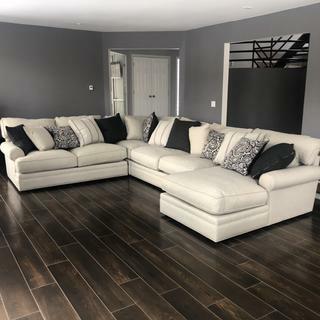 We received our sectional last week, we fell in love with it at the store, it’s material, depth and construction is particularly what we have been searching for. We wanted an extra deep, 2 piece sectional with a chaise, and this is was it!!! The pillows are cozy yet sturdy enough that don’t seem will flatten any time soon, the extra deep sitting is so comfortable and inviting, the material is nice and soft yet sturdy for constant use by three kids. The pillows it comes with are down and add to the comfort and coziness. Overall just wonderful sectional. The delivery was smooth, the delivery guys were kind enough to take their shoes off as our rugs are white. They set it up and it looks so cozy in my kids playroom. This is now our favorite place to lounge as a family. Want exactly the same but bigger for our family room. The costumer service was exceptional at the Freehold, NJ location. 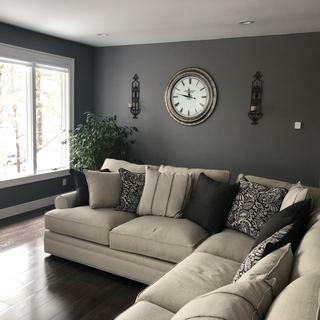 From the sectional to the clock, sconces and accent chairs, beautiful set! We spent a lot of time looking for the perfect couch that would accommodate our family, while also providing comfort and a great appearance. This sectional is exactly what we were looking for. Love it! Looks great and very comfortable! Fits perfectly in our large living room! Does this come in a smaller option?